King Felipe and Queen's Leitzia's Mexico Visit, It's PDA and Smiles in Monaco & Latest British Royals News! We have a selection of updates from several royal families to share with you in today's Royal Roundup! 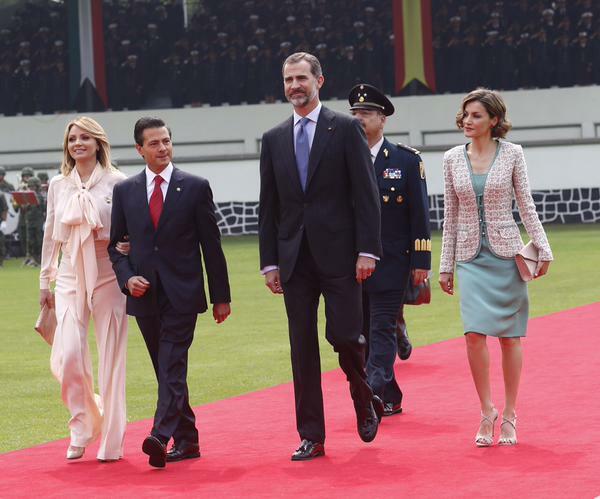 King Felipe VI and Queen Letizia of Spain travelled to Mexico for a three-day state visit and Letizia did not disappoint in the style department - selecting an array of chic, sophisticated ensembles. Upon arrival, the couple were officially welcomed by President Enrique Pena Nieto and the glamorous First Lady Angelica Rivera in Mexico City's Campo Marte military camp. Continuing the trend, Letizia chose a Felipe Varela skirt suit for a luncheon at the Palace. The royals signed an agreement of the implementation of the Spanish Teaching System for Foreigners during a visit to the Universidad Nacional. Aside from the red Varela dress, this was my favourite look from the trip. Letizia chose a white and burgundy floral print skirt with a stylish burgundy blouse. On the final day of their trip, Queen Letizia attended a congress of the Latin American Alliance for Rare Diseases before joining her husband where he gave a speech in front of members of the Mexican Senate. What did you think of Letizia's style during the trip? Over in Monaco, it's been a week of heart-warming PDA photos beginning with this adorable shot of Prince Albert and Princess Charlene at a Water Safety event organised by Princess Charlene's foundation. Ninety children aged 7 to 11 participated in the event and took part in a variety of workshops with the royals promoting awareness and the risks of swimming, along with basic first aid skills. Charlene appeared to have a wonderful time on the day. 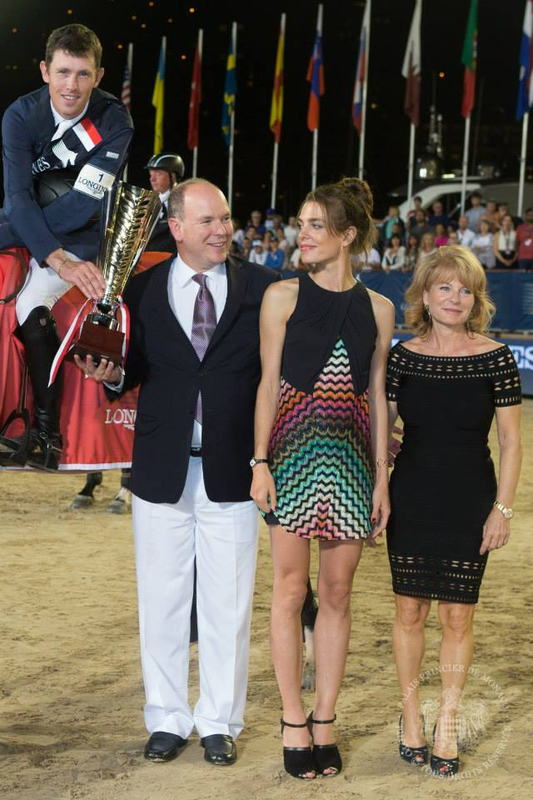 Despite recent rumours reporting Charlotte Casiraghi and her partner Gad Elmalah have parted ways - the couple showed they remain very much an item at the 10th Monte-Carlo Jumping - Longines Global Champions Tour of Monaco. 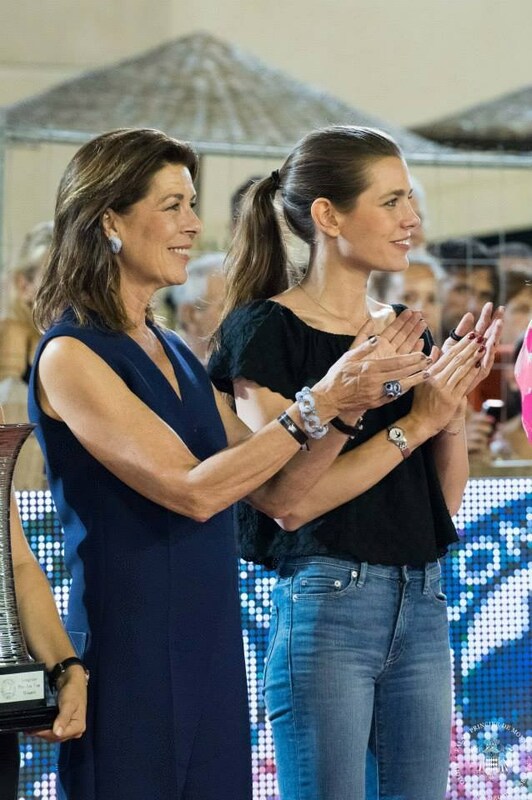 The talented Charlotte participated this year and her mother Princess Caroline supported her daughter at the event. Prince Albert joined his niece to hand the cup over to the winners of the tournament. We also take a brief look at recent appearances by members of the British Royal family. Princess Beatrice repeated the RED Valentino Trench Coat she wore at Sandringham for the annual Christmas service for the Formula E Race for electric cars in London. The Princess was accompanied by her mother, Sarah Ferguson. Beatrice chose a long sleeve black floral-print romantic dress by Reformation for the NSPCC Neo-Romantic Art Gala. The 'Veronica' dress is now sold out. The Prince of Wales, the Duchess of Cornwall and Princess Eugenie photographed at the start of an auction during a 'Travels To My Elephant' Royal Rickshaw Event in support of the Elephant Family, a charity set up by the late Mark Shand, the Duchess of Cornwall's brother. Meanwhile, the Duchess of Cornwall's appearance at the Hampton Court Flower Show with an ice-cream cone in hand perfectly captures the glorious weather we're enjoying right now! The Countess of Wessex made a stylish appearance at the Future Dreams Midsummer Night Party at SushiSamba. The fabulous HRH Countess of Wessex blog noted Sophie wore an Emilia Wickstead blouse and an Oscar de le Renta Broderie Anglaise skirt. It is reduced from $2,390 to $979 at Moda Operandi. 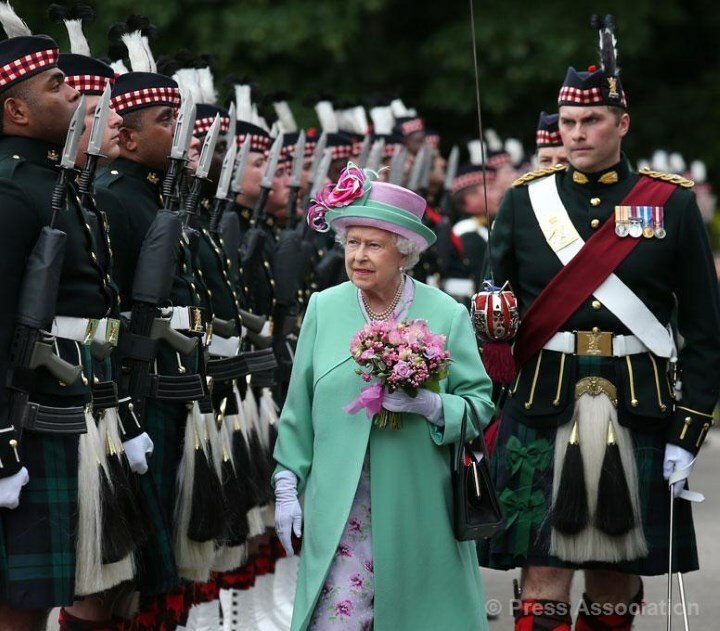 Finally, Her Majesty the Queen was greeted by a Guard of Honour from the Royal Highland Fusiliers, 2nd Battalion, Royal Regiment of Scotland as she arrived at the Palace of Holyroodhouse at the start of Holyrood Week. Many will be familiar with adorable images of Prince William and Prince Harry taken in 1985 at Kensington Palace. A fact I was unaware of - the family photos coincided with a surprisingly candid interview which saw veteran newsreader Sir Alistair Burnet discuss an array of topics in the drawing room in a no holds barred interview. As the interview began, Diana was asked about William going to school and if she was felt sad on his first day; "I was. It's opening another chapter in my life and certainly William's but he's ready for it he's a very independent child and he's surrounded by a tremendous amount of grown ups so his conversation is very forthright." Other questions included: "Have you actually tried to change Prince Charles since you married?" "Would you say you had may common interests, many mutual friends?" "Do you have any sense of living in a state of rivalry with Princess Anne?" "How much time do you have to give to your clothes?" It's was quite extraordinary, and could you possibly imagine the Prince of Wales and the Duchess of Cornwall, or the Duke and Duchess of Cambridge in such an interview today? Charles was frank on a number of topics, including his views on vegetarianism and his thoughts on his wife's wardrobe: "One of the things I always noticed about her before we got married, I thought was, she had a very good sense of style. She's always dressed very well I think." When asked if they had disagreements, Charles's reply sparked a rather ironic exchange. "I suspect most husband and wives often have arguments," the Prince said, to which Diana replied, "But we don't". "Occasionally we do," Charles added, but Diana continued, "No, we don't". Of course we now know all was not well in the Wales marriage, and at times it showed the couple were not on the same page. One aspect I particularly enjoyed was seeing both Charles and Diana interact with the boys as photographs were being taken. There's a very endearing moment where Charles places Harry on William's shoulders, and the boisterous prince calls to his nanny, "Barbara, look". There are lovely moments where we see Diana sitting on the floor with her sons, too. The Prince and Princess encouraged their sons to play "louder, louder" on the piano. You can watch the interview in full on YouTube. It's an immensely enjoyable watch for royal watchers who may have been fans of Prince Charles and the late Princess Diana, and equally so for younger royal watchers who may have grown up reading endless stories about the couple. It's a unique interview, which I felt gave a rather interesting insight into their characters and personalities. Today we're taking a look at the latest news from several royal families, beginning with Monaco. It's been a busy month for Princess Charlene who carried out several glamorous engagements during the week. 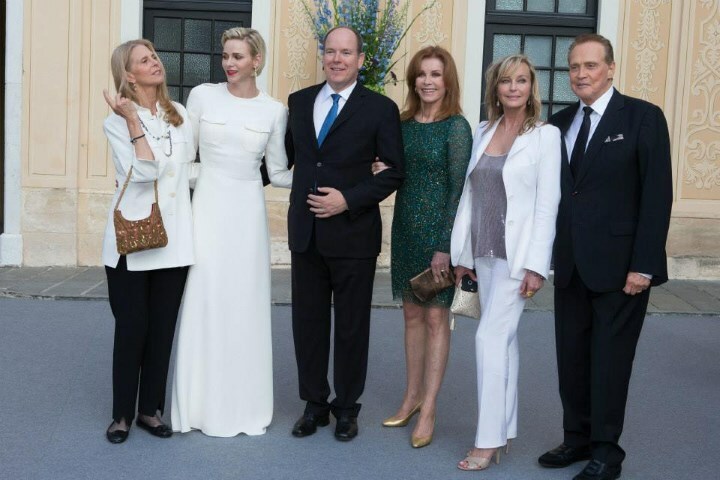 Her Serene Highness joined Prince Albert to greet Hollywood stars at the Prince's Palace for the 55th annual Monte Carlo Television Festival. Below we see the couple with Lindsay Wagner, Stefanie Powers, Bo Derek and Lee Majors. At first glance, I thought Charlene's long-sleeved white gown was a showstopper; the silhouette and structure is perfect for her statuesque, athletic frame. However, I'm not loving the military detail, which may be better suited to an outerwear piece. Charlene's sleek hair and red lipstick looked fantastic and her pair of statement earrings were a fabulous addition to the look. Albert and Charlene also attended the 33rd International Swimming Meeting; the glitzy event is a perfect engagement for former Olympian Charlene who has made supporting sport and swimming a priority in her charitable work. Charlene chose a striking blue dress with a deep v neck for the event. Do you like it? 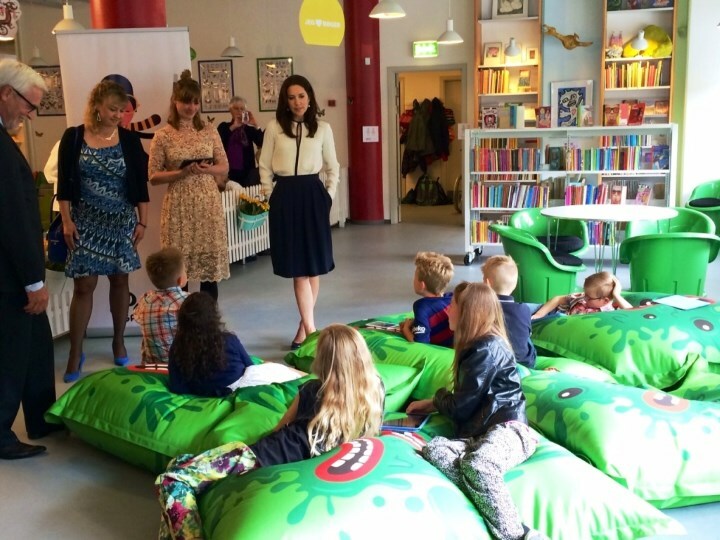 Over in Denmark, a stylish Princess Mary officially opened the children's libraries reading campaign "Summer Book" in Odense. The campaign aims to encourage children to read at least three books and review them before August 22. Afterwards, the Crown Princess visited the Danish Fashion Now exhibition. Interestingly, Mary is actually participating in the exhibition and loaned ten of her Danish-designed dresses. Mary chose a classic, chic look to carry her through both engagements. The Style of Mary website revealed she wore the £295 Joseph Matt Silk Bibby Blouse; the tailored textured silk piece is a very elegant addition to one's wardrobe. Mary teamed it with a navy skirt and Rupert Sanderson Winona Pumps. Queen Maxima looked colourful for the for the opening of the Design Derby Netherlands - Belgium at the Museum Boijmans van Beuningen, in Rotterdam. Maxima chose a customized Natan dress with orange accessories and a statement hat. King Felipe VI and Queen Leitizia attended the 'Order of the Civil Merit' ceremony at the royal palace. 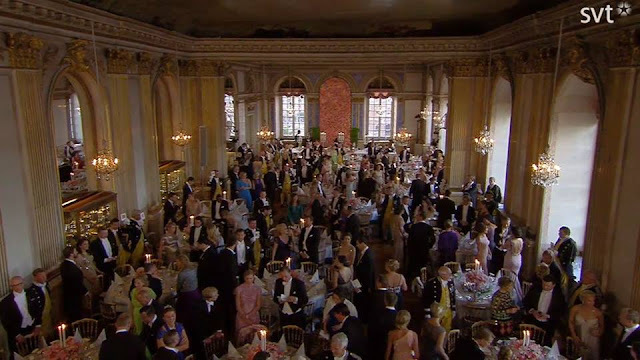 The Duchess of Cornwall brought out the big guns from the jewellery box for the Duke of Wellington's Waterloo Banquet at Apsley House, London. Camilla donned the Greville Tiara - also known as the Boucheron Honeycomb Tiara - one of two tiaras the Queen Mother wore in her later years with the Greville Festoon Necklace. The Duchess of Wellington wore a black gown and fabulous jewels too. The Greville is a fascinating piece and one we'll cover in depth for a future Tiara Time post! The Battle of Waterloo was commemorated today in the United Kingdom and Belgium where various members of European royal families joined dignitaries at events to mark the victory of coalition forces over the armies of Napoleon I of France on 18 June, 1815. In London a special service was held at St Paul's Cathedral and attended by Prince Charles, the Duchess of Cornwall and the Earl of Wessex. Prime Minister David Cameron also joined the service. The battle took place near Waterloo is what is now Belgium. The Seventh Coalition forces were led by Arthur Wellesley, 1st Duke of Wellington and Field Marshall Gebhard von Blücher of Prussia, and contained forces from the United Kingdom, Prussia, the Netherlands, Hanover, Brunswick and Nassau. In Belgium, the event was marked at the Lion's Mound on the site of the Battle of Waterloo. Royals in attendance included Grand Duke Henri and Grand Duchess Maria Teresa of Luxembourg, King Philippe and Queen Mathilde of Belgium, King Willem-Alexander and Queen Maxima of the Netherlands and the Duke of Kent. The construction of the mound was ordered as a memorial to the battles at Waterloo and at Quatre Bras by King William I of the Netherlands and completed in 1826. The royal ladies looked regal for the event with Queen Maxima opting for a sophisticated grey dress with matching hat and shoes. While Queen Mathilde selected a vibrant yellow and white print dress with a short jacket. 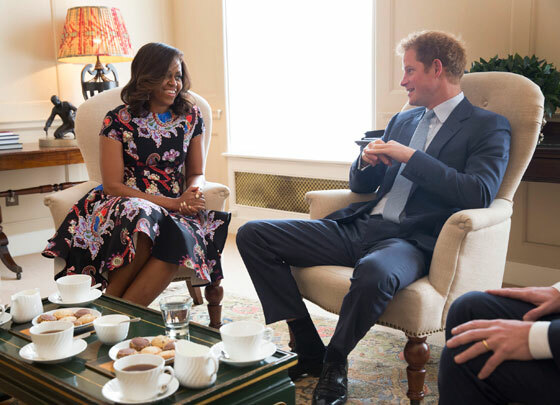 Also, the ever charming Prince Harry welcomed First Lady Michelle Obama to Kensington Palace for tea on Tuesday. They discussed their shared interest in support for veterans and their families. Harry was also interested to hear from the First Lady about the Let Girls Learn initiative to further adolescent girls' education around the world, which is the focus of her visit to the United Kingdom. Prince Harry was also delighted to meet Malia and Sasha Obama and The First Lady's mother Mrs Marian Robinson. Finally, we're delighted to share the first photos of Princess Madeleine's son Prince Nicolas Paul Gustaf. The Prince has been given the title Duke of Ångermanland, a province in northern Sweden. Van Cleef & Arpels has been the official supplier to the Principality of Monaco since 1956. It came as no surprise when Prince Albert commissioned the Parisian jeweller to create a necklace that can be worn as a tiara as a wedding gift for his bride, then Charlene Wittstock. In honour of her background as an Olympic swimmer, the diamond and sapphire piece is composed of 1,200 gemstones crafted into circular elements evoking the sea. Prince Albert appropriately chose the name 'Ocean' for the sparkling piece. 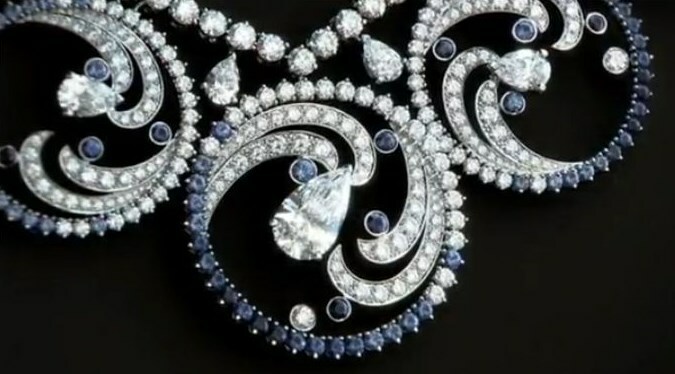 The necklace includes different shades of sapphires capturing different sea colours as well as pear-cut diamonds to suggest water droplets. 'Ripples shimmer on a ribbon of white gold and round-cut diamonds. 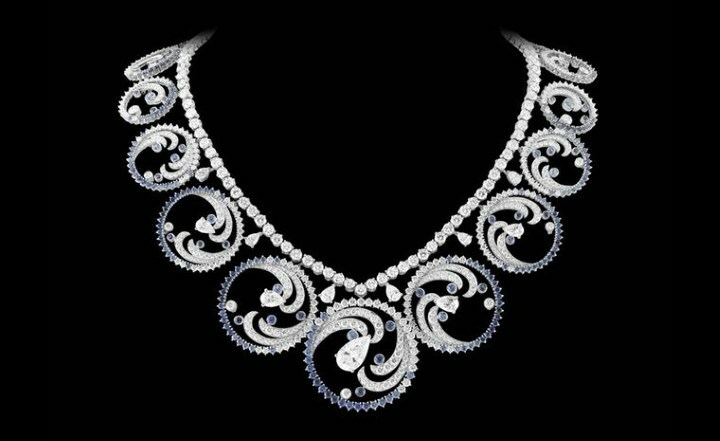 The frothy lace of diamonds sparkles with the water’s reflections and diffuses into fabulous asymmetrical circles. The waters of the sea, made of blue sapphires, carry 11 pear-cut diamonds in their gentle swell. Océan, the necklace, transforms into a royal tiara. The jeweller described the piece as a "pledge of love, offered by the prince to his princess. Ocean exalts the grace and elegance of the bride". In the fascinating video below you will see the creative process and meticulous work applied to designing such a timeless piece of jewellery. An immense amount of planning and consideration went into ensuring it was very much a piece that represented Charlene and her love of the ocean. We first saw Charlene wear the Ocean tiara as a necklace at the Red Cross Ball in 2011. It looked simply stunning and Charlene allowed the piece to take centre stage while wearing a simple no-frills, strapless gown and an elegant updo. We first saw Charlene wear the piece as a tiara for an exclusive interview with Hola! and it was instantly evident how well it suited her. Charlene's style tends to be minimalistic with regard to her clothing, jewellery, and hairstyle choices. The tiara provided a 'Wow' factor for the shoot. Another look from the shoot. Charlene didn't wear the tiara during the wedding festivities because she loaned it to the Oceanographic museum; in fact, it's been part of several exhibits since. Below we see Her Serene Highness posing beside the tiara at a Van Cleef & Arpels exhibition launch in Paris in September 2012. You'll notice the drop earrings Charlene wore for the exhibition appear to be part of a set with the tiara containing the same diamond and sapphire circle. I'm enormously surprised by how seldom Charlene has opted to wear the necklace/tiara. There have been many functions in the last couple of years when it would have been a perfect choice for the occasion. Here's hoping it gets another outing soon! What do you think of it? Do you like it? 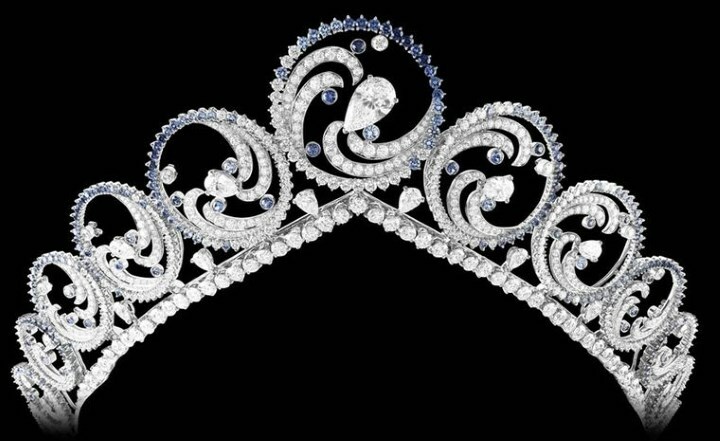 I personally tend to prefer classic tiaras with a strong history, however as modern designs go, this is one of my favourites! We're back with something of a royal roundup, keeping you abreast of the latest news and appearances from our favourite royal families. What better way to begin the week than with royal baby news? 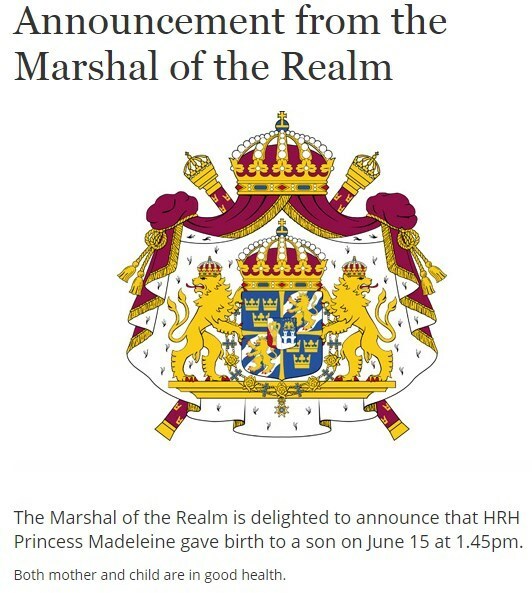 It was announced today Princess Madeleine gave birth to a son on 15 June at 1.45 pm. The statement continued: "Both mother and child are in good health". The baby boy is the couple's second child - they also have a daughter, Princess Leonore, who is sixteen months old. It is expected the children will be brought up in London as the family are due to move to Chris's native Britain later this year. 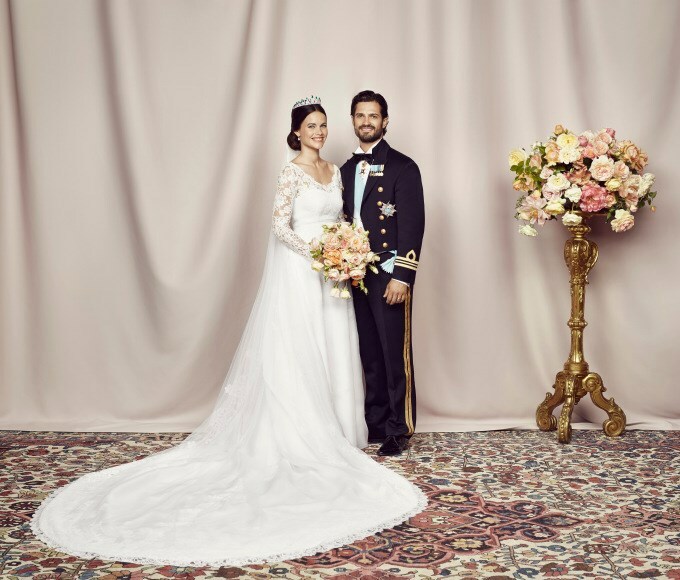 It's been an incredibly exciting time for the Swedish royals with the latest arrival and Prince Carl Philip and Princess Sofia's wedding on Saturday. Below we see Madeleine, Chris and Leonore arriving for the big day; I actually had no idea Madeleine was so close to her due date when writing about the wedding. Madeleine looked radiant in a sparkling tiara and jewels and a flowing Elie Saab gown. 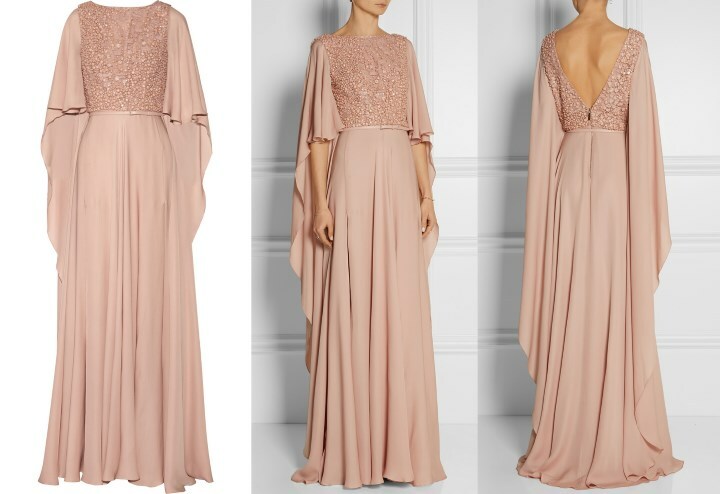 'Anne in Texas' kindly mentioned the Embellished Belted Silk Gown is still available in limited sizing for £4,800 at Net-A-Porter. I'm an enormous fan of the designer and enjoyed seeing product shots of the gown; it's very much a 'Princess' gown and worked very well as a maternity piece. Congratulations to Madeleine and Chris! Over in Monaco, Princess Charlene has been making a return to her usual schedule of engagements. The Princess was surrounded by stars of television as she opened the 55th Television Fesival in Monte Carlo. Attendess included Dallas star Patrick Duffy and Nashville's Eric Close. 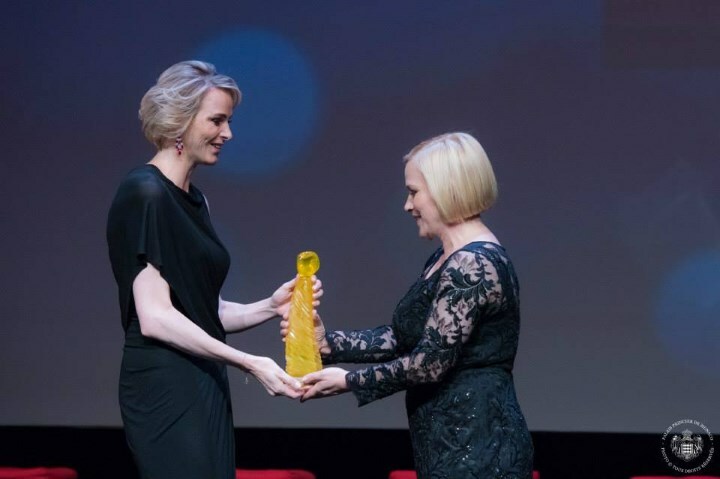 Charlene presented Patricia Arquette with an award. Charlene sported a softer look than usual; she's been growing her hair a little longer and I think it looks great. Her black asymmetrical dress with sparkling ruby and diamond earrings made for a chic look. It was a busy day for the British royals. Her Majesty Queen Elizabeth II, Prince Philip, Prince William and the Princess Royal joined Prime Minister David Cameron and other dignitaries to mark the 800th anniversary of the Magna Carta. 'Magna Carta means The Great Charter in Latin and was originally issued in 1215. It was the first document forced onto a King of England by a group of his subjects, the feudal barons, in an attempt to limit his powers by law and protect their privileges. The charter required King John of England to proclaim certain liberties and accept that his will was not arbitrary. It was an important part of the process that led to the rule of constitutional law in the English speaking world. From there, the royals made their way to Windsor Castle for the Order of the Garter ceremonies (we normally cover this event over at Duchess Kate Blog, but as Kate was not present this year I thought it appropriate to cover it over here). The Most Noble Order of the Garter, founded in 1348 by Edward III, is the highest order of chivalry existing in England. St George is the patron saint of the ceremony. The Queen appoints the Knights of the Garter without advice from ministers and this year there will be no new knights installed into the order. Interestingly, Prince William was the 1000th Knight on the register when he joined the order in 2008. There can only be 24 members of the order at a given time, so it is a huge honour to be chosen. Her Majesty and Prince Philip during the carriage procession. Camilla, Duchess of Cornwall and Sophie, Countess of Wessex. Sophie, who has just returned from Sweden where she and Edward represented the Queen at the royal wedding, recycled a vibrant green 1950's style bespoke dress from British brand Suzannah. Finally, Queen Letizia was stylish today in a dark blue suit and striking pink shirt for the annual Students Residence meeting. I do love a royal wedding, don't you? 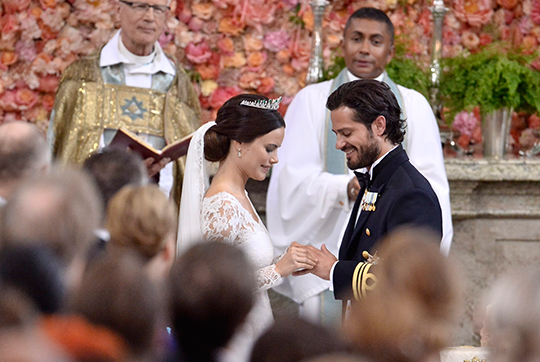 Sweden's Prince Carl Philip married Sofia Hellqvist today in a beautiful ceremony in the chapel at Stockholm's Royal Palace. Prince Carl Philip with his best man. 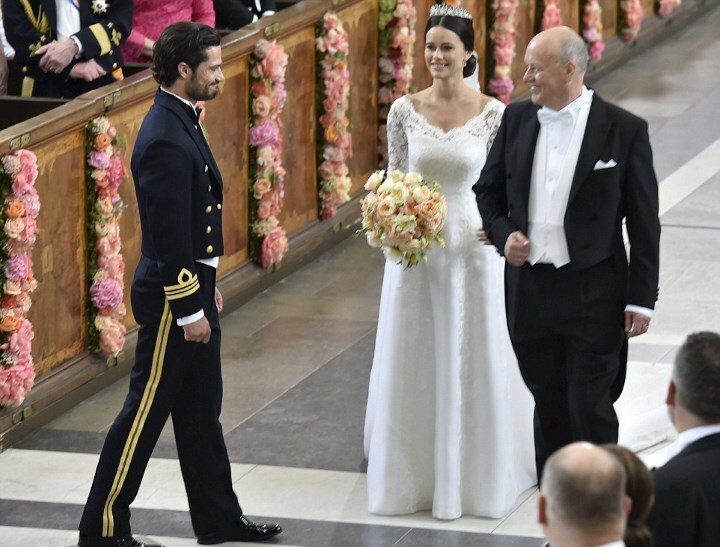 Sofia's father Erik Hellqvist walked his her down the aisle to an arrangement of Athair ar Neamh by Irish singer-songwriter Enya., where she was met by husband-to-be. Both Carl Philip and his sister Victoria were seen wiping away a few tears of joy. The couple chose a colourful selection of music for the wedding service. The variation ranged from Hymn 200 - Go Seek, My heart, The Joys of life to Rhianna's Umbrella and Coldplay's Fix You. Despite the magnitude of the event, Carl Philip and Sofia added plenty of personal touches ensuring their personal stamp was there. 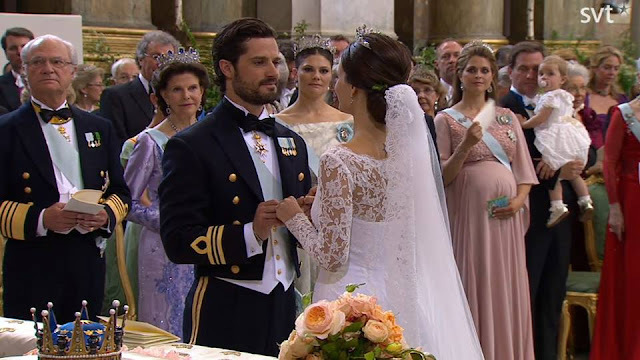 Prince Carl Philip revealed "We wanted to make it our day" during a pre-wedding interview. A general view of the Palace before the wedding began. 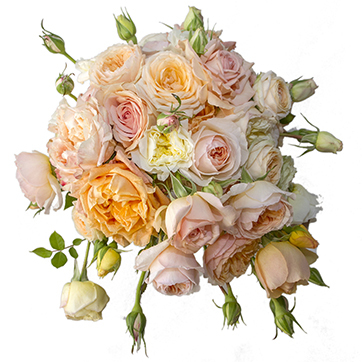 The floral decorations for the Royal Wedding followed the colour scheme chosen by the couple for their invitations, mixed with natural elements. The colour scheme ranged in tones from cream to coral. 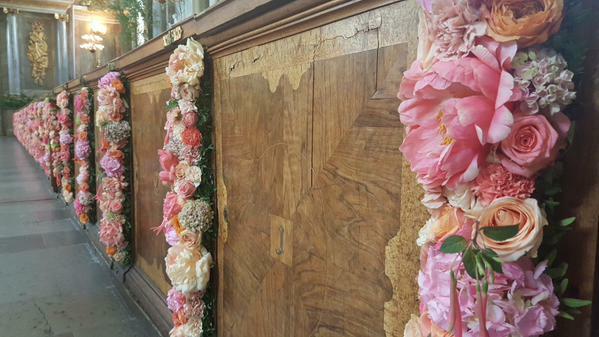 The flowers chosen were roses, hydrangea, carnations, sweet peas, peonies and fuchsia. The natural elements were twigs of birch and raspberry, wild chervil and ferns. 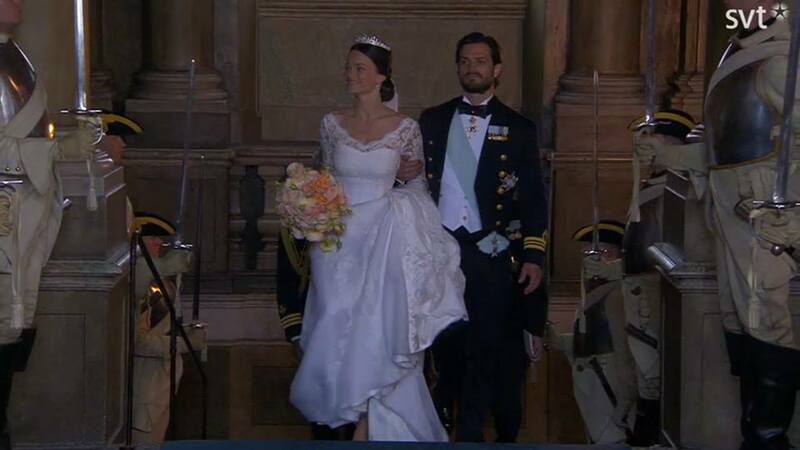 Sofia looked stunning in a timeless gown by Swedish designer Ida Sjostedt. The dress is made from silk crepe overlaid with Italian silk organza. Couture lace made by José María Ruiz was applied to the dress and the train was hand-cut and then hand-stitched in Ida Sjöstedt's atelier in Stockholm. A look at the train. The gown was created in three shades of white. 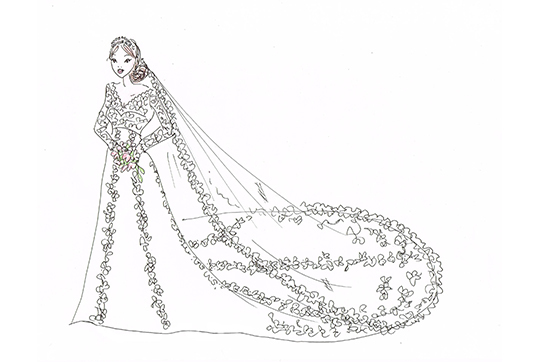 Below, we see a sketch of the wedding dress. The veil in thin bridal tulle was also hand-embroidered with sheer cotton lace. The bride's hair and make-up were by Marwan Hitti and William Värnild. 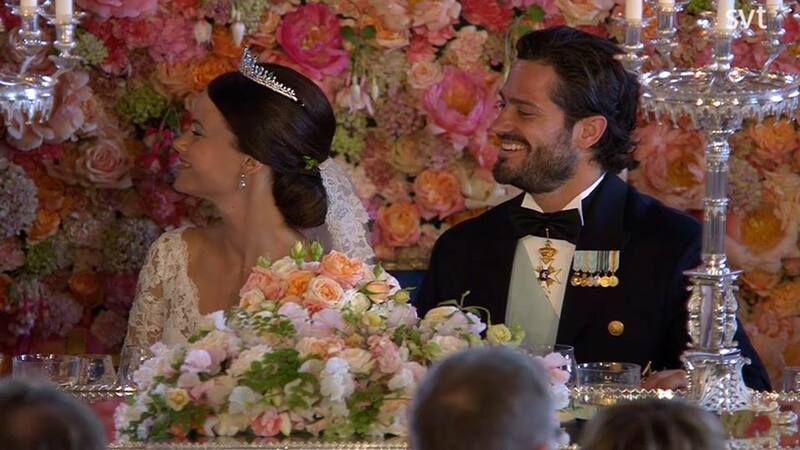 There was much speculation regarding which tiara Sofia would wear for her wedding, and the striking emerald and diamond creation is new - it was a gift from the King and the Queen. The couple exchanging their vows. 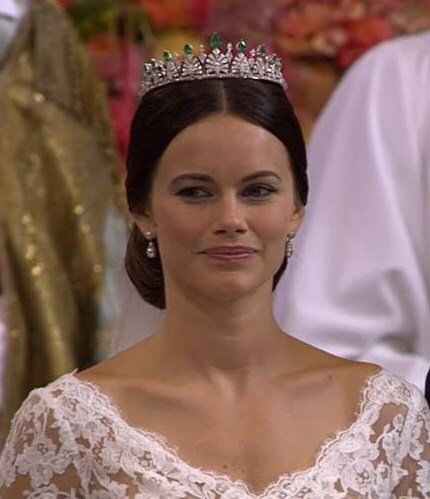 Sofia who will be styled as HRH Princess Sofia, Duchess of Varmland. A lovely shot of Sofia and Victoria. The guest list was filled with royals (pretty much a tiara lovers dream). The Earl and Countess of Wessex represented Her Majesty today. Sophie looked elegant in a gown by Tatana Kovarikova, a Czech designer, the gown was an official gift on her recent trip to Prague. The jewels were loaned to Sophie by The Queen. 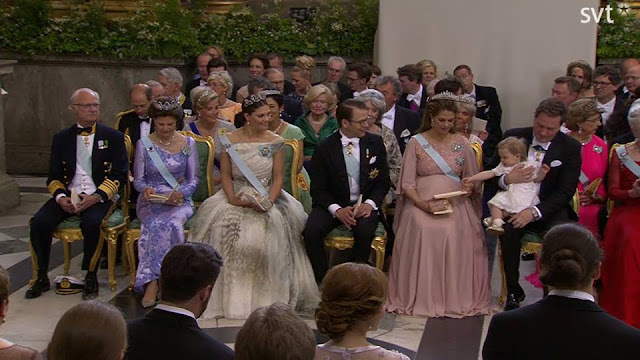 Sophie's aquamarine tiara is by G. Collins & Sons, a piece we haven't seen her wear in some time. Crown Princess Victoria selected a dress from the H & M conscious collection and completed the look with the diamond Connaught tiara. Princess Madeleine looked radiant in a flowing gown thought to be Elie Saab and the Modern Fringe tiara. Proud parents the King and Queen. Prince Mary looked elegant in a blue gown. Queen Margrethe II was regal in red. Another stylish look from Queen Mathilde. Crown Princess Mette-Marit opted for a pink print Giambattista Valli ensemble. 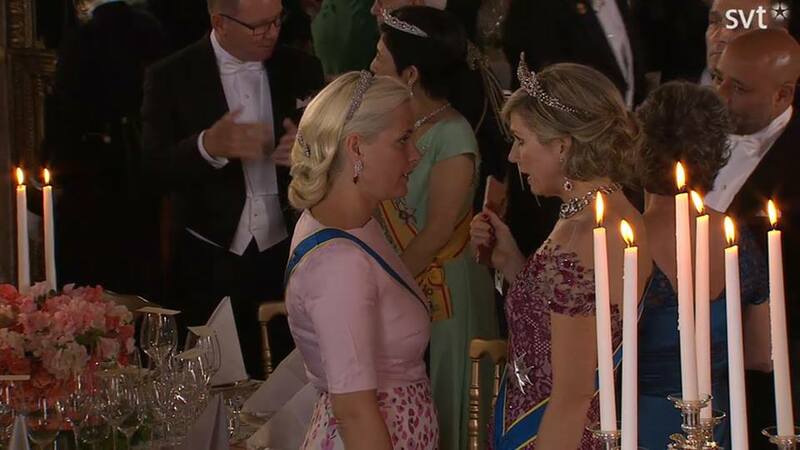 Queen Maxima looked dazzling in a gown by Jan Taminiau and jaw-dropping jewels. It was a very elegant look for the Queen and perhaps my favourite wedding guest ensemble. After the wedding, the bride and groom were taken by horse and carriage from the Royal Palace of Stockholm along the Outer Courtyard, Slottsbacken, Skeppsbron, Slottskajen, Norrbro, Regeringsgatan, Hamngatan, Nybroplan, Nybrokajen, Hovslagargatan, Södra Blasieholmshamnen and Strömbron, ending below Logården. Immediately after their arrival at Logården, a 21-gun salute was fired at five second intervals from Skeppsholmen. The Swedish Armed Forces paraded along the route of the cortège and on arrival at Logården. Maxima and Mette-Marit mingling at the reception. I'm interested to see Sofia's role develop within the royal family and to see which areas she lends her support. Undoubtedly, many of the headlines you'll read today will focus on her past, and many will omit to mention she co-founded the Project Playground in 2010, a charity which helps disadvantaged children in South Africa. She has also worked as a volunteer in several African countries. The official wedding portraits were a delight to see. 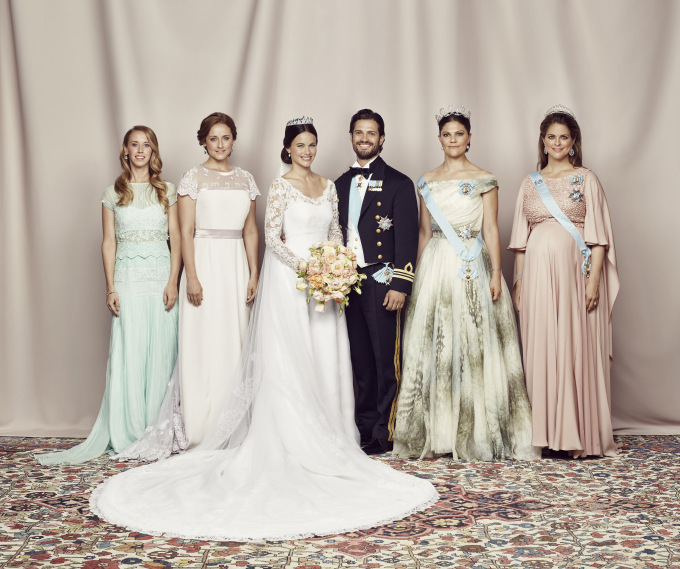 The royal couple with their respective sisters - Crown Princess Victoria of Sweden and Princess Madeleine and Lina and Sara Hellqvist. You can watch the wedding on You Tube.